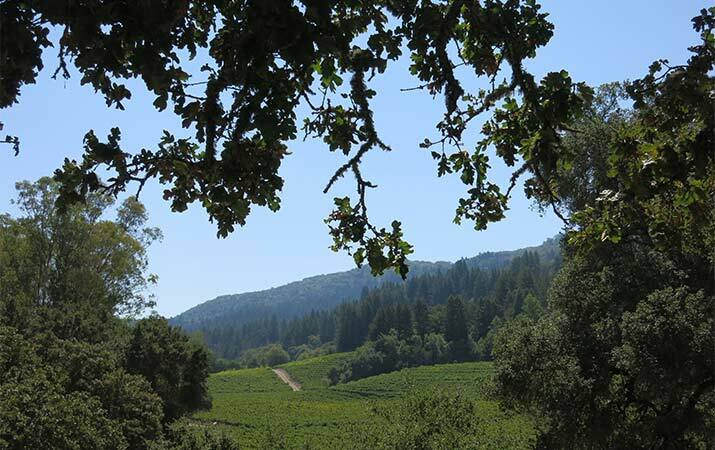 A warm sunny day ahead of us, last weekend we drove up the Sonoma Valley to Sugarloaf Ridge State Park – perfect for a picnic and hike. After years of drought in California, last winter was rainy, and now the hills are emerald green, bright yellow mustard in bloom, an endless blue sky. On the way we stopped into Carneros Deli, Rte 121 (Bonneau Rd). to pick up excellent sandwiches and other picnic supplies. The turnoff to Sugarloaf Ridge State Park is Adobe Canyon Rd., just past Kenwood on Rte 12. At the entrance to Sugarloaf Ridge State Park, pick up a map, and list of family hikes. Stop into the Visitor Center to learn more about the, habitats, plants and animals of the area – gray foxes, bobcats, racoons, rabbits, lizards, gray squirrels, coast redwoods, oaks, ferns. 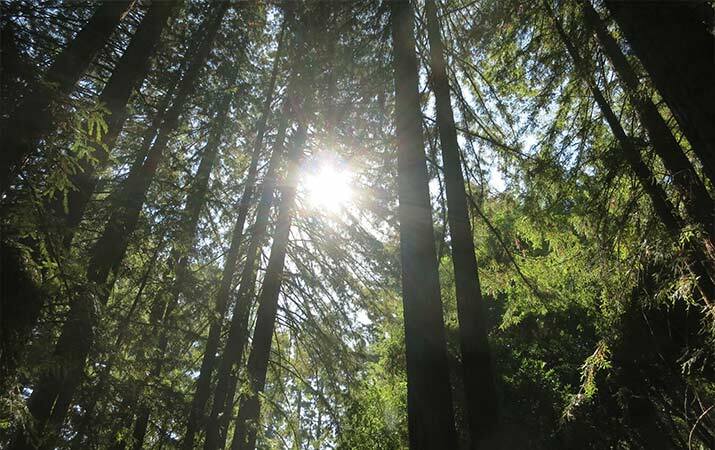 The park has twenty five miles of hiking trails, bubbling creeks and a seasonal waterfall 25ft high, panoramic views (you can see San Francisco from Bald Mountain on a clear day), picnic tables in the shade, campground, public observatory for nighttime viewings. 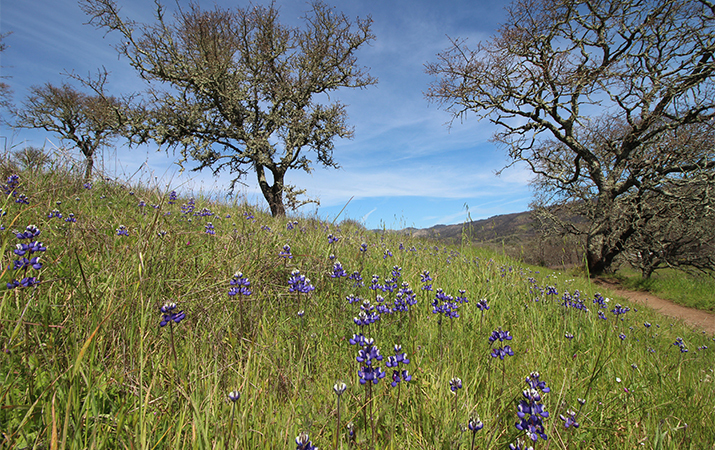 We started out on the Meadow Trail – bit early in the season for tons of wildflowers, but in season the meadows and hills are full of California poppies, lupine, buttercups, lilies, and monkey flowers. Just before the bridge, picnic tables under the trees were perfect for our lunch. Continue on a short distance – the trail splits into the Gray Pine and Hillside Trails. We took the Gray Pine Trail, climbing up to the headwaters of Sonoma Creek and Bald Mountain trail. Even if you don’t make it to the summit of Bald Mountain, there are stellar views of the entire San Francisco area. To the east we could see east to Mt Diablo, and looking west – the skyline of San Francisco! With younger kids, consider playing in little creeks surrounded with ferns and moss-covered rocks, look for fluttering butterflies or gray squirrels with fluffy tails bounding through the oak trees, watch ladybugs land your shirt, and listen to birds in the trees. Update March 2019. A blue sky, sunny Sunday we tossed together a picnic lunch, and zipped up to Sonoma Valley Regional Park on Sonoma Highway 12 in Glen Ellen. We took the Cougar Trail up the hill, lots of white milkmaid and yellow buttercups along the trail. At Damselfly Pond, two ducks glided across still waters, while we ate our lunch at the picnic table overlooking the pond. Continuing down Cougar Trail, we crossed the creek and turned back up Valley of the Moon Trail, branched off at the Milkmaid Trail to the Woodland Star Trail. At the top of the ridge were panoramic views, the hillside covered with lupine. 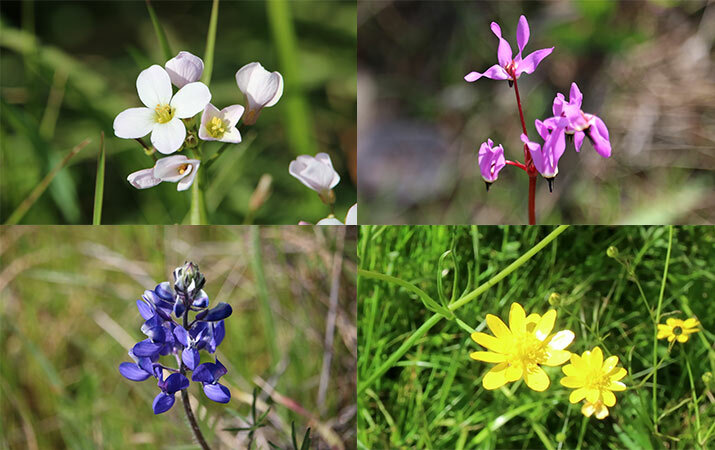 Wildflowers in the photo – White Milkmaid, pink Shooting Star, blue Lupine, yellow Buttercup. 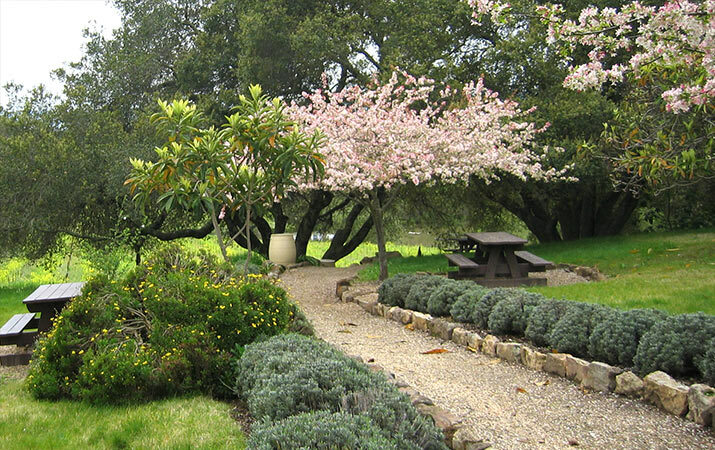 Another favorite springtime destination for hiking is Jack London State Historic Park. Jack London, author of White Fang and Call of the Wild, was also a farmer and rancher. It’s fun to explore the grounds around the farm buildings, including a “pig palace” designed by Jack London, and see old-fashioned ranch equipment. Out favorite hike is the Redwood Trail to the Ancient Redwood. Walk through a redwood forest to a giant gnarled redwood, 2,000 years old – it looks like something out of a fantasy story. 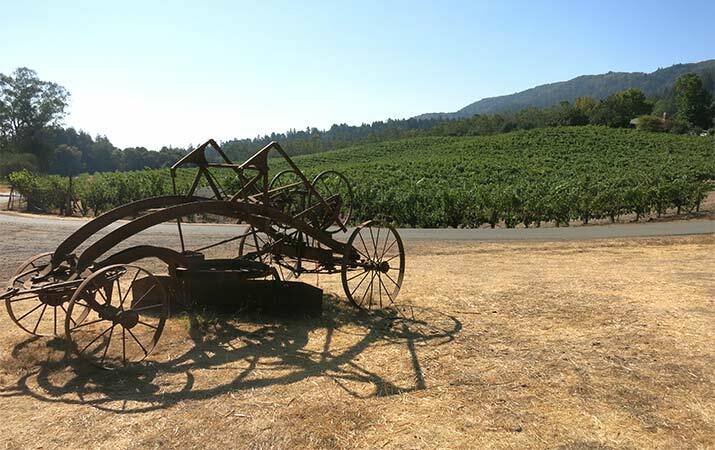 The town of Sonoma is a year round destination, but especially in spring, it’s fun to take a bike ride from the plaza to Bartholomew Park Winery, and then bike along the Sonoma Valley bike path to Maxwell Farms Regional Park. Bikes are available for rent at Sonoma Valley Bike Tours on Broadway or Wine Country Cyclery on Napa Street. Starting at the plaza, go east on Lovall Valley Rd. to Castle Rd. to the Bartholomew Park Winery. Find a table under the trees, and spread out your picnic. After lunch, bike back down to the Sonoma Valley Bike Trail, and ride west, past Depot Park and Vallejo Home, to Maxwell Farms Regional Park, then return the way you came. Tip: If you have time, stop off to see the 19th century Vallejo home. One of our favorite spring events is Somona County Farm Trails. Visit local farms, sample locally made food, pet farmyard animals. Flowers are blooming, bees are humming, new baby animals – adorable baby goats, lambs, chicks – are running around. Farm Trails is particularly fun for toddlers and younger kids.